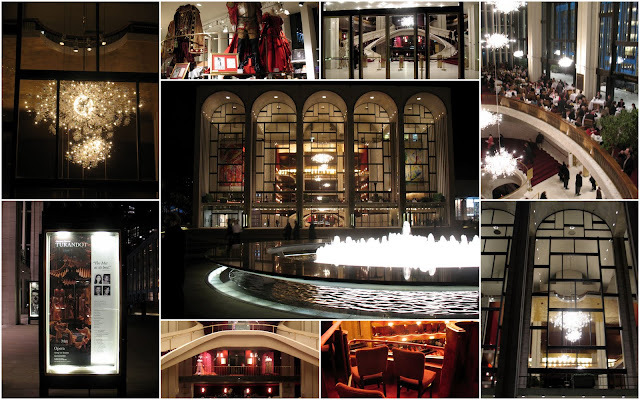 I attended the 284th performance of Giacomo Puccini's Turandot at The Metropolitan Opera in Lincoln Center, New York on January 20. 2010. The mosaic above shows views outside and inside the opera house --please click on to enlarge to see the details. Turandot was the last opera Puccini wrote, and is based on the play by Carlo Gozzi called Turandotte, a fairy tale set in an imagined Orient. Unfortunately Puccini died before he could complete it, but luckily he left many sketches behind which allowed composer Franco Alfano to complete it. 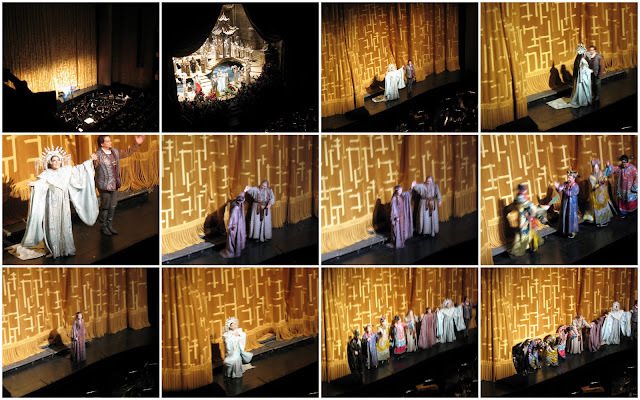 I've seen the The Metropolitan Opera's Franco Zeffirelli production many times, and it never ceases to amaze me with it's large cast, elaborate costumes and glittery, spectacular sets. The choreography by Chiang Ching is exquisite. Andris Nelsons was the conductor - his Met debut this season was Turandot. The three act opera takes place in Peking in legendary times. Near the city walls a Mandarin reads an edict that any prince seeking to marry Princess Turandot must first answer three riddles. If he fails he will be executed. Calaf, an exiled Prince, decides that he will attempt to win her hand in marriage, over the protest of his father Timur and the slave girl Liu, who secretly loves Calaf, despite the fact that many Princes had already tried, failed, and were put to death. Calaf stuns the cold and treacherous Princess Turandot by answering the three riddles, and the Princess begs her father not to give her to this stranger in an emotional aria. Calaf decides to give her a riddle of his own to answer. If she can guess his name before dawn he'll die for her. Turandot issues a proclamation that no one can sleep until the stranger's name is discovered. Threatened with torture, Liu singing a dramatic and emotional aria, kills herself rather than reveal Calaf's name. Assured of victory, Calaf sings "Nessun Dorma" and then at dawn he takes Turandot in his arms and forces her to kiss him, and tells her his name. As the people hail the emperor, Turandot approaches the throne and announces the strangers name is "Love." 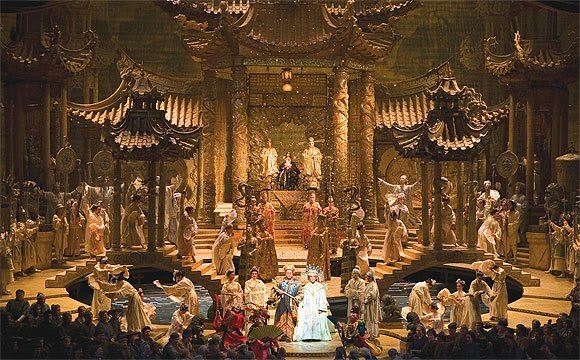 The entire synopsis of Turandot can be read on this link on The Metropolitan Opera web site. The role of Turandot was performed by soprano Maria Guleghina and the role of Calaf was performed by tenor Salvatore Licitra. If you would like to listen to the magnificent aria "Nessun Dorma" this Youtube shows a wonderful rendition by the three tenors, Domingo, Carrerras and Pavorotti. There are two more operas in my subscription this season - La Boheme and La Traviata. I hope you will join me then to read about those magnificent productions. I will be excited to introduce someone very special who is making their Metropolitan debut in the La Traviata production! Linking to Mary at The Little Red House blog for Mosaic Monday --please visit Mary to see her beautidul mosaic and links to other blogs participating today. 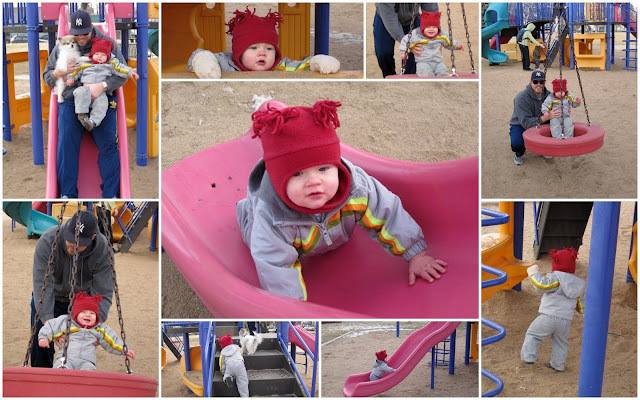 My daughter-in-law sent these photos to me this week of my son and grandson and their constant companion, their Pomeranian Maurizio, having fun in a local park where they live in Colorado. When I saw the pink slide I thought of Beverly's Pink Saturday event and decided to share them with everyone today. As you can see in the photos, my little guy is walking now! How fast grandchildren grow! It is hard to believe that my son has a birthday approaching ... I remember so vividly how he loved the the playground when he was this age. Sons grow up fast too! 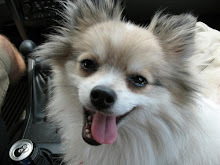 Beverly asks that we profile a new blog that we discovered through the previous week's Pink Saturday. I enjoyed Bernideen's Tea Time Blog...it is always tea time at Bernideen's pretty blog. Bernideen is from Colorado Springs and says "My blog is about all things tea and tea parties, hospitality and food the love of decorating, florals, faith and summer gardening." Please pay her a visit today. To see a list of participating blogs in today's Pink Saturday blog posts please visit Beverly at How Sweet The Sound, and enjoy all the pink! I am joining Jenny Matlock's fun "Alphabe Thursday" event and the letter for this week is the letter "B" I know it's not very original, but I couldn't resist sharing some photographs of local birds that I took in the past few weeks. After looking at my photos I think the letter "B" is also well represented by the color blue, as the winter skies were uncharacteristically bright the days I took some of the photos. I was even able to add a third "B" to this post as you'll read towards the end. These two young gulls were standing in the water of the Gerritsen Beach inlet.on a very cold day. They stood motionless for so long that I suspected that they were sleeping. I saw this flock of pigeons in a local park taking turns using a puddle as a birdbath. If you enlarge the photo you can see the water droplets being flung around as the bird in the water shook the water over his wings, He's a little blurry but if you look closely to the top left of the puddle in this photo you can also see one of the wild parrots of Brooklyn watching the spectacle! Mainly sparrows frequent my bird feeder every day. I even caught one in flight! They are the most common type of birds that I see in my area, and so prolific in number that they will empty this feeder in a few hours. I buy bird seed in large quantities to feed the little fellows. To see some spectacular bird photos drop by Betsy from Tennessee's blog Joyful Reflections Many different types of birds come to her bird feeders and she often captures beautiful close up photographs of them for her wonderful blog. "The Great Backyard Bird Count is an annual four-day event that engages bird watchers of all ages in counting birds to create a real-time snapshot of where the birds are across the continent and in Hawaii. Participants count birds anywhere for as little or as long as they wish during the four-day period. They tally the highest number of birds of each species seen together at any one time. To report their counts, they fill out an online checklist at the Great Backyard Bird Count web site." This information is used to determine if the health and well being of native and migratory birds are normal and the effects of disease, cold temperatures and invader species might be having on the bird population. Just for fun I wanted to mention that I was "grilled" yesterday by Lisa from the blog called "Grandma's Briefs"! Her blog header made me laugh so much when I first saw it! Please click on the blog link to read my interview and say hello to Lisa and read about all her wonderful grandma experiences. Even the cold gray month of January has its beauty! ....while the bare tree branches trace feathery lines across the sky..
....and the pine trees tenderly hold the snow in their boughs. ...and is as silent as a cemetery. of life which bring us warmth and comfort. And also Susan of the blog A Southern Daydreamer for her Outdoor Wednesday event. After leaving the Mount Rushmore National Memorial this summer we traveled south along the Peter Norbeck Scenic Byway towards the Iron Mountain Road where these wonderful distant views of the Memorial can be seen (all photos will enlarge when clicked on) . We then drove on towards route 16A where we entered Custer State Park. Custer State Park located south of the Black Hills of South Dakota, is the state's first and largest state park, and is named after Lt. Colonel George Armstrong Custer. The sprawling 71,000 acre park of open grasslands and rolling hills is home to roaming buffalo, four mountain lakes and a variety of hiking, biking and walking trails. The park is also home to one of the world's largest publicly-owned bison herds, which can easily be seen along the Wildlife Loop Road. Bison can be dangerous, so it is strongly advised that you view them from a distance, or from the safety of your car. 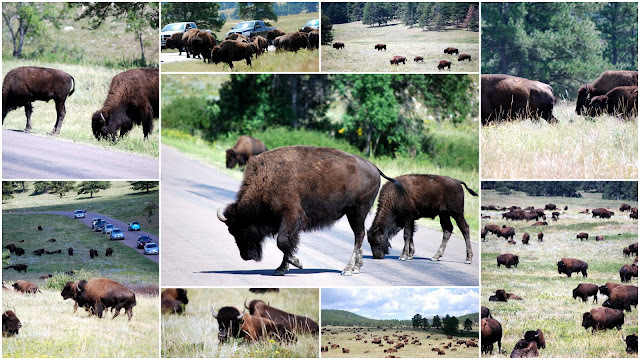 There are nearly 1,500 bison, commonly called buffalo, roaming the prairies and hills of Custer State Park. .....and wild turkey and burros. The "begging burros," as they are commonly called, are a herd of wild-roaming donkeys who are fond of begging for food from park visitors. The day we visited they were more interested in seeking out the shade under the trees. 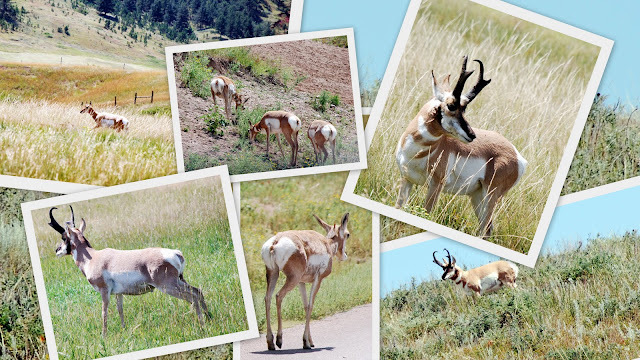 Custer State Park is definitely a wonderful place to visit if you are spending time in the Black Hills area of South Dakota and an excellent park in which to see wildlife and to enjoy wonderous views. 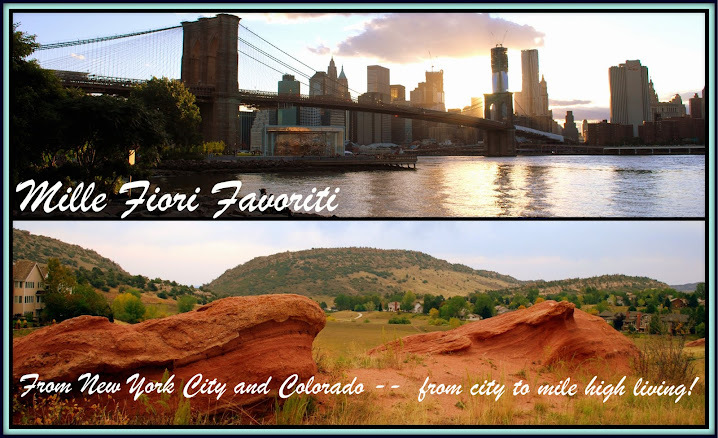 I'm linking this post to Mary at The Little Red House blog's Mosaic Monday event. Please visit Mary's blog today to see her pretty mosaic and links to other participating blog's mosaic marvels! 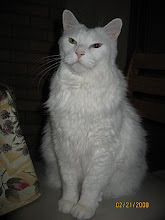 I'm unable to download new photos on my computer because of a defective optical drive that won't allow me to install my camera software, so until the replacement arrives I'm using some photos from my old photo files. 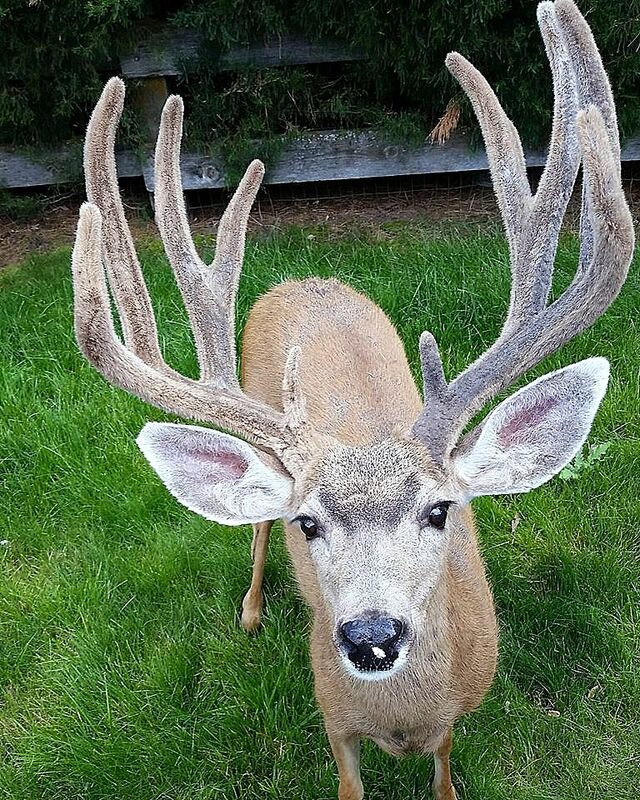 I found these interesting photos to share from South Dakota. My husband and I visited South Dakota this past summer and enjoyed seeing Mount Rushmore and The Crazy Horse Memorial, The Badlands National Park, and The Minuteman Missile National Historic Site, which I blogged about during the summer, but we also saw two other beautiful areas in South Dakota, one of which was the 14 mile long Needles Highway (SD 87) , part of the Peter Norbeck Scenic Byway. We were amazed to see tour buses being able to pass through this narrow tunnel! The scenery was full of massive granite pinnacles, spires, and outcroppings of granite throughout rugged terrain. It was definitely a road on which you had to drive slow, not only because of the hairpin turns and narrow tunnels. but also because you want to see all unusual formations and views. The beautiful views were of the Black Hills of South Dakota. They were originally given this name by the Lakota Indian because of their dark appearance from a distance caused by their dense covering of pine trees. South Dakota Governor Peter Norbeck (1917-1921) carefully planned the highway to provide scenic views without disrupting the natural setting. Needles Highway was completed in 1922. Sylvan Lake is located at the end of the Needles highway. It was created in 1881 when Theodore Reder built a dam across Sunday Gulch. All photos can be enlarged when clicked on, and if you enlarge this one you might be able to see the multitude of minerals that are in the Black Hills. Rock formations such as these are so full of minerals and crystals that they actually sparkle in the sunshine! Needles Highway is considered one of the most scenic highways in North America and I'm glad we were able to see it on a beautiful day during our vacation. 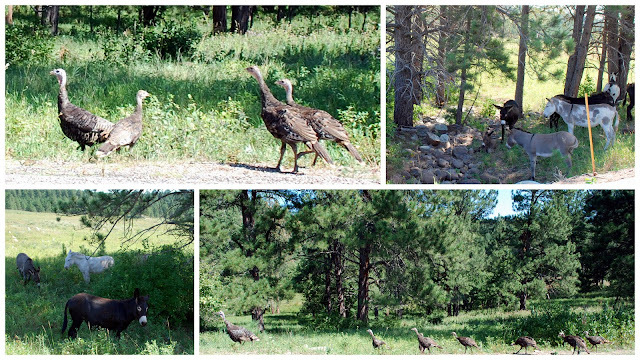 Next blog post I'll show Custer State Park, also in South Dakota. 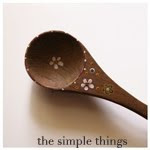 I'm adding this post to Claudia of Dippity Road blog event "Friday Finding Beauty." 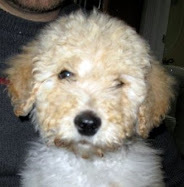 Please visit Claudia today to see her post and other participating links which found beauty in their lives this week! Do you ever feel like you are living life backwards? I've been having a few frustrations lately that are making me feel that way. I wouldn't mind if this phenomena was reversing the effects of time on my skin and hair, but I think it's actually contributing to the wrinkles and the gray. My favorite airline to fly to Denver, the one who's credit card I use all the time so I can accumulate frequent flyer points, is eliminating their one daytime direct flight from New York's JFK Airport to Denver International Airport and is going back to one direct flight to and from both airports only during late night hours! That will mean an almost midnight arrival to Denver and an after midnight departure when I want to return to NYC. That is going to make visiting my sweet little grandson more difficult for awhile, until I can find another carrier. My relatively brand new one month old lap top computer that my husband gave me as a Christmas gift, after my old computer died, has developed a problem with the optical reader. I can't install programs and it needs to be replaced (thankfully under warranty). Unfortunately this was only discovered after 6 hours of "on the phone" tech support in which the tech made me do all sorts of different checks and finally made me back up and then delete all programs on my computer and then reinstall from backup, only to confirm what I already knew, that the part wasn't working properly. Now I have to start all over AGAIN with trying to re-install all my photos and files and favorites. All of this happened after I spent 3 hours waiting in a radiology office in the morning, to have a routine 10 minute sonogram performed, because the staff quadrupled booked appointments! Why do doctors and labs feel a patient's personal time isn't important and appointments are overbooked like that? Luckily for me I was able to entertain myself with the one tattered magazine from the year 2005 that was being passed around by everyone in the waiting room. Sigh. Putting it all into perspective, however, I have my health, and food, clothing and shelter, and my family is all alive and well. So these are all very minor frustrations. Watching a tragedy like Haiti unfold on TV makes me realize all I have to be thankful for, and how minor all my problems are in reality. As an aside, have you seen this backwards " lip dub" video on Youtube as yet? It really made me smile when I needed something lighthearted after watching so much sadness. It was made by Shorewood High School in Seattle, Washington. I wish every high school in the world could be like this. It is obviously a school full of great students, great classes and resources, and great teachers. This was a video production class project and the answer to a challenge from a rival school who made their lip synch video a Youtube success. Remember the students are filming and singing the Hall and Oats song "You Make My Dreams Come True" backwards! I think I better start learning some lyrics in reverse so I can keep singing along in my "backwards" life. Please give me a few days to catch up with you all -- thanks! 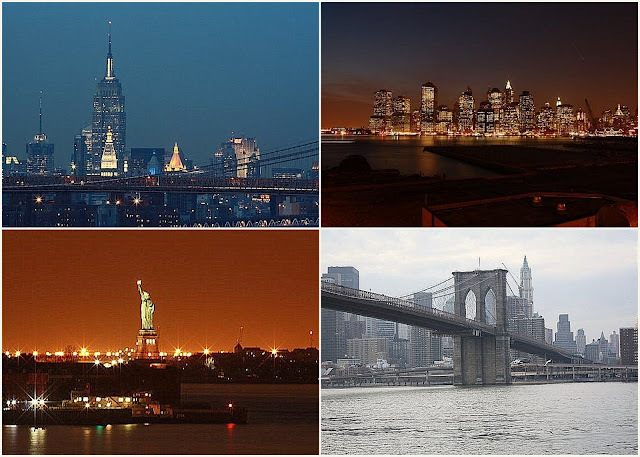 I was looking through my photo files this weekend and came across these four iconic views of New York City that were taken at different times of the day and in different weather conditions. I thought they would be perfect for Mosaic Monday. In the two top photos the city heartbeat throbs and pulses across the river, with diamond lights displayed on a velvet sky. In the bottom left photo Lady Liberty holds her light high in an orange twilight harbor, while on the right the Brooklyn Bridge stands solid, silent, cold and grey on an overcast winter day. They are views I see often, yet never tire of. It's my city of lights and contrasts, colors and neutrals, ever changing yet always the same. It's home. 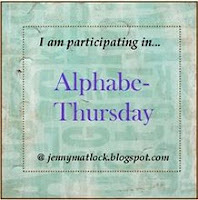 Be sure to join Mary at The Little Red House blog today for Mosaic Monday! Friday Finding Beauty - "The Reading Mother"